How much for 65 kilos of coco beans? We visited a cocoa plantation today, had a tour and learned a great deal of interesting information. Chocolate lovers: have you ever wondered where your sensuous treat begins? In Africa, in a “cocoa ball” or pod. 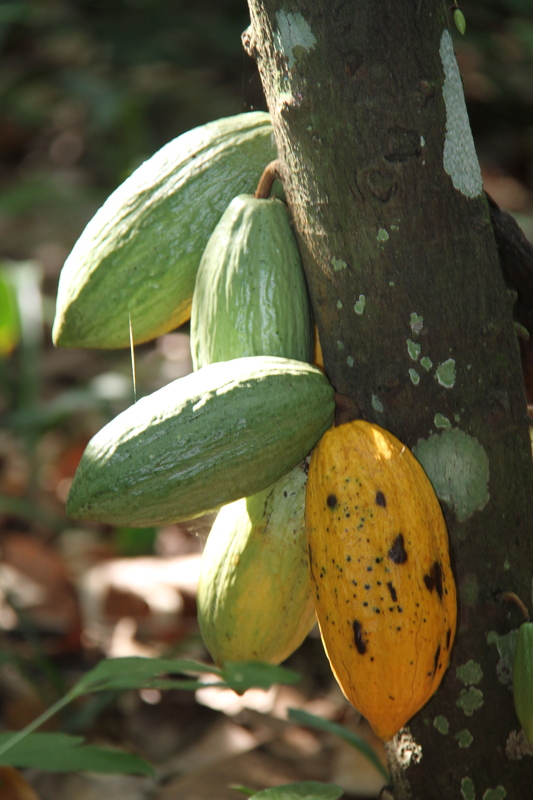 Cocoa beans in the pod are not brown, like you’d expect, but snowy white surrounded by a slimy mucous. 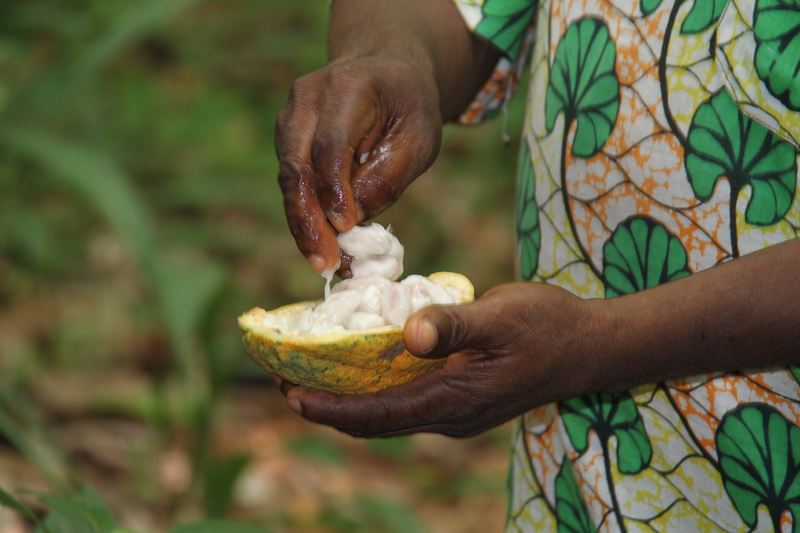 When the cocoa pods are ripe (they turn yellow or red depending on the type), they’re split open, the beans hand-mixed with the mucous, then left under a banana leaf to “ferment” for a few days. After the fermentation process, the beans are scooped out and dried in the sun, which is when they turn brown. Ghana has two seasons; the wet season and the dry season. 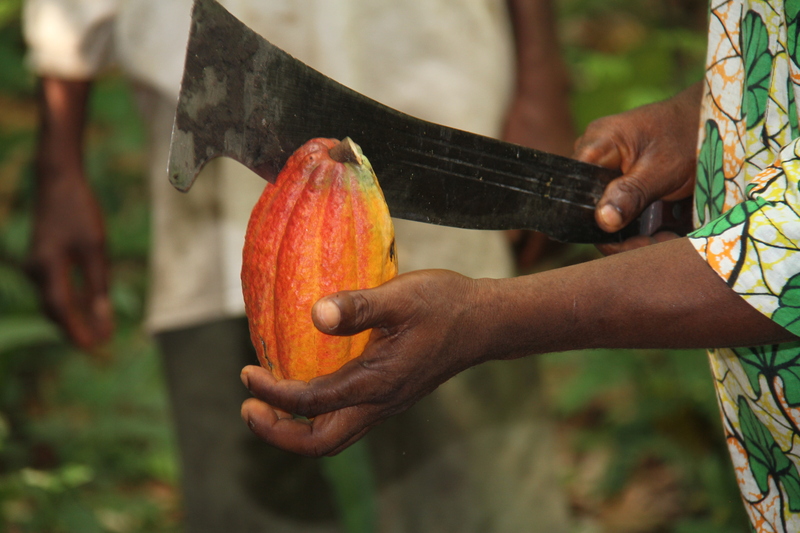 As you can imagine, most of the cocoa crop is harvested in the wet season, when the plantation is fertile. 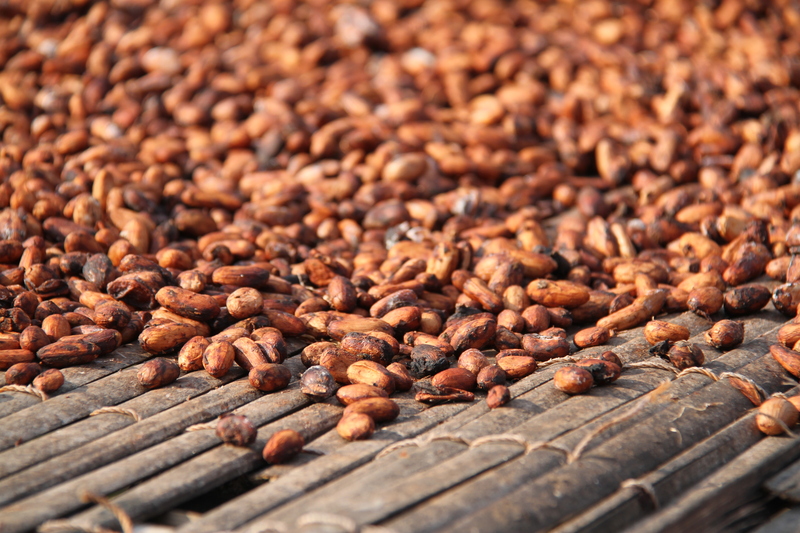 This particular plantation produces, on average, 10 bags of cocoa beans in the high season. A bag holds 65 kilograms of beans and each bag is sold for 200 GH (Ghanaian cedi), which amounts to approximately $100. Have you done the math in your head yet? This $1000 per season income supports the owner and crew of workers. Cocoa farmers sell their crop to the government, which sets this fixed price of 200 GH for a 65 kg bag. “Organic farms” get approximately $50 more per bag, and ironically, though this particular farm didn’t have the “organic” status, they can’t afford to buy pesticides so essentially they’re organic, they just don’t get to collect organic prices. If all of the cocoa plantations in Ghana could unite into a coalition, they could perhaps negotiate a better price from the government. DIVOG has been trying to talk to farmers about this prospect, but Robert says it’ll take, perhaps, years to convince farmers that this is “safe” and a plausible “way out” of poverty. I was left wondering how much the Ghanaian government gets from cocoa traders for each bag, and if there is a middleman who makes a huge cut. What about Fair Trade? I’ll have to do more research to learn how Fair Trade is fair in Ghana—at this particular plantation; there was no evidence of fair trade. Like coffee and roses from Africa, I wish the profits of this export would benefit the people who work the land and struggle to support their families.